crafty caroline: Christmas is here!!! Good morning. No, I have not gone mad, but Christmas has come a few months early. It's all because there is a Christmas event on Create & Craft / Ideal World. 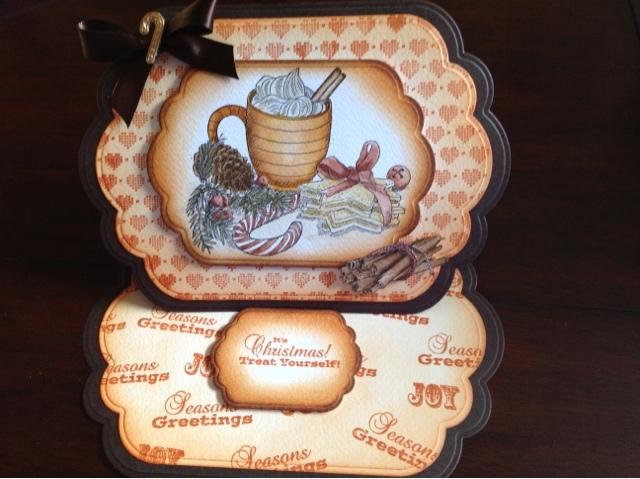 I have been lucky enough to play with some of Sheena Douglass new Christmas stamps...........WOW, is all I can say. I have water coloured the main image with Tim Holtz distress pens, and the cinnamon sticks in the bottom corner too. The heart background is also a stamp from the range which I have used to make the background, as are all the greetings I have used at the bottom of the easel. I used Rusty Hinge for the background and distressing. Sheena is on Ideal World today at 11am, and 3pm. Don't forget to get your mulled wine and mince pie watch her live.